Free download Icy Tower game for PC. It is very interesting arcade game for PC. The game is very simple to play with simple achievement. You goal is to climb up the tower as high as you can without falling down. After installing the Icy Tower game, you are required profile name. Enter your own name as profile name for Icy Tower. The main menu of Icy Tower game consists of Play Game, Instructions, Profile, High Scores, Load Replay, Options and Exit. Options menu has GFX Options, Sound Options and Controls. With Sound and Controls options, you can change sound, music and game controls options. GFX options has further more options which are Character; from where you can change your player character, there are four character available in Icy Tower, Start Floor, Eye Candy, Full Screen; you can enable full screen using left or right arrow key to turn it into ‘Yes’. Icy Tower has ‘Load Replay’ and ‘High Scores’ options in its main menu. From ‘Profile’ menu, you can view your detailed profile with your all records. If anyone else wants to play from your computer, you can ‘Change Profile’. Instructions menu of Icy Tower tells you how to play this game. This menu tells you how to help Harold, the player, to climb the tower. 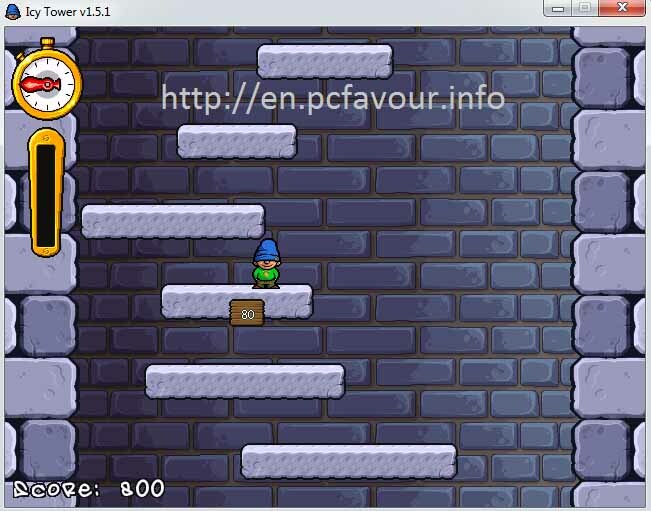 Icy Tower can be played easily with the help of Spacebar, left and right arrow keys. You can take a higher jump by running faster. You can do this by long pressing left or right arrow key but remember that it may cause fall of your player down. Making higher jump will give you a ‘Sweet’. You have to climb over and over up. Each platform is considered as floor. You will earn 10 score reaching each floor. When you will reach at 10th floor, you will see the floor number plate.